This is the way Journey explained the problems of trying to carry on a relationship while out touring. One of the stand-out tracks from Frontiers, it has a soft lilt that exposes an emptiness. But this is augmented by the lush rhythm and the way that Perry croons his way through without ever wallowing in over emotional hyperbole. A power ballad in the best Journey tradition. 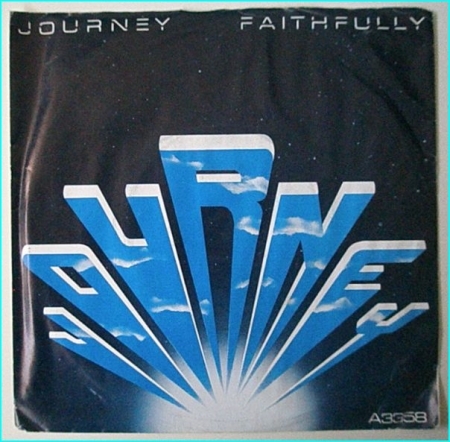 “Faithfully” is a popular song and power ballad by the band Journey, and the second single from their album Frontiers. It peaked at #12 on the Billboard Hot 100, giving the band their second consecutive top twenty hit from Frontiers. The music and lyrics were written by keyboardist Jonathan Cain and performed by Steve Perry. While the song was relatively successful on the charts, it has gone onto become one of their most recognizable songs, and has enjoyed lasting popularity. The music video featured a then-unique “life on tour” theme parallel to the songs lyrics, showing the bands performances in different venues and their travels around the USA. Steve Perry can be seen shaving his short-lived but talked-about moustache in the video. 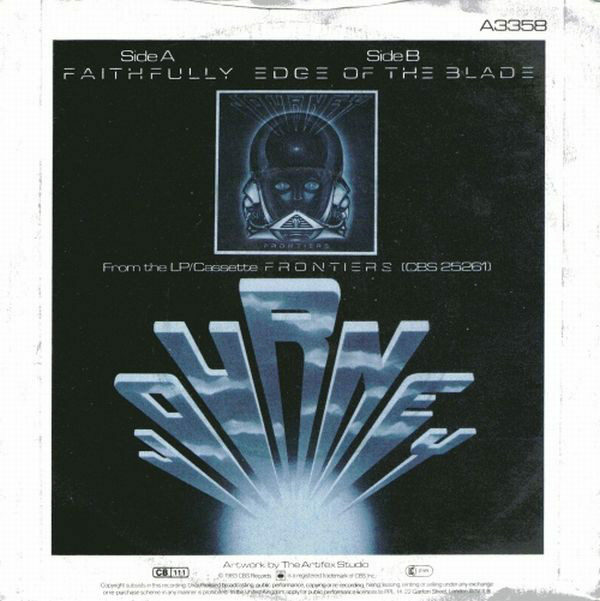 This video utilized footage from the documentary video Journey: Frontiers and Beyond. The concept of the “road video” was later utilized by several other bands, including Bon Jovi, Guns N’ Roses, Genesis, Mötley Crüe and Richard Marx. One morning, Journey’s Jonathan Cain woke up in his tour bus to the stench of diesel fuel and with the beginning of a rock anthem scrawled on a napkin. He told the story of writing “Faithfully” to Bart Herbison of Nashville Songwriters Association International. Bart Herbison: “Highway run into the midnight sun.” There is not a greater opening line in the history of music. I’m thinking “Stairway to Heaven,” the first two lines aren’t that good. Wow, Jon! Jonathan Cain: Well, I was on a bus and we were rolling along after a show. I sat out waiting for some of the crew to come with us. They were taking the big stage down. I was seeing these riggers pulling it all down, and I just sat out there in this big empty auditorium. I thought, “Man, you know, these guys are sacrificing this time with their families or loved ones to be out here with us.” And I started thinking, “Wouldn’t it be great if we had a song we could sing for all of us, because we’re all missing our loved ones, and all making that road sacrifice?” So I went to the bus with that thought. And I had a napkin and it was those first four lines. BH: A songwriter actually did write a song on a napkin? JC: On a napkin, yeah. “Wheels go round and round, you’re on my mind.” And then I (thought), “Well, I’m tired. I’m gonna keep this and go lay down in the bunk.” So I did. And back in those days, you wake up smelling like diesel. So we were up to upstate New York. I took the napkin to my (hotel) room, put all my bags down and just fell asleep. I woke up and I looked at the napkin. And I had a little Casio MT30 keyboard. I was plunking around on it and I’m trying to get an idea for the melody. And then, you know, “Restless hearts, sleep alone tonight. Sendin’ all my love along the wire.” What next? Well, I reckon it’s a Holy Spirit moment, because I’ve never written a song in 20 minutes. JC: Yeah, so I’m filled with this idea. And it’s a supernatural moment that I’ll never forget. There was sunlight just streaming in the window. And me and this napkin, and a little keyboard this big on the bed, you know? BH: You had to know it was special, right? JC: Well, I knew it had something. I knew anytime you have that innocence and that transparency and you’re able to let your guard down as a man, and tell a woman that you’re forever hers. I was having trouble with my marriage at the time, and so my wife came on the road and I played it for her. And she just gave me a big old hug. It meant a lot to her that I had written it. BH: Tell me you still have that napkin. JC: I do not. You know what happened? This is a sad story. This is the way things go. They were, Sony, was looking for memorabilia. You know, for their floor downstairs they have like this big exhibit they were going to put up. And so they asked me if I had my lyrics, and I gave them my book with the napkin, and I never got it back. BH: So they still have it? JC: No, it’s gone. I looked. Everything is gone. BH: Universe, bring that back. It’s his. 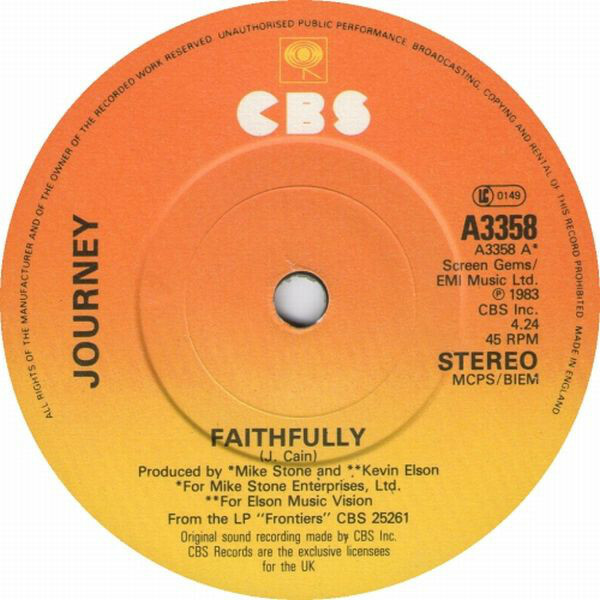 Clearly, Cain’s bandmates agreed — and so did a number of Journey’s musical peers. Not long after “Faithfully” hit the airwaves, Cain got a call from Prince, who, he recalled, played him “Purple Rain” and said, “The chord changes are close to ‘Faithfully,’ and I don’t want you to sue me.” To his credit, Cain came away from the conversation with anything but a lawsuit on his mind. As it turned out, it wasn’t the only extra hit to grace the airwaves with a little bit of “Faithfully” DNA. Bryan Adams‘ longtime songwriting partner Jim Vallance attributed road-induced musical osmosis to their own 1984 hit “Heaven,” admitting they were influenced by that song in particular after Adams toured with Journey as their opening act. SKU: YP-1956 Categories: All Genres, AOR, Hard Rock, Pop, Rock, Search by Media Type, 7"